The Next Big Thing to Worry About that you’ll soon be reading about in the financial press is Italian banks. Some Italian banking stocks fell more than 30% after the Brexit vote on fears that the Eurozone will experience weaker-than-expected economic growth. 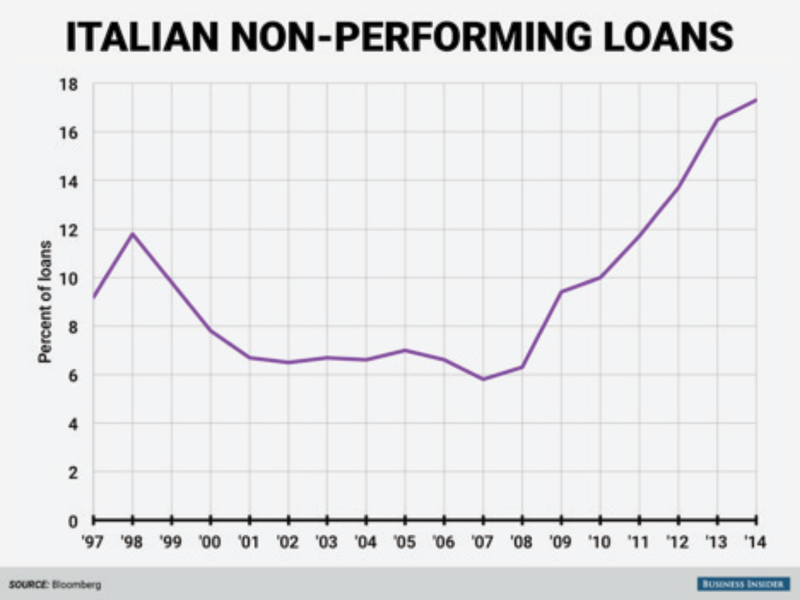 Worse: the Italian banking system now reports that nearly $400 billion worth of its collective loans are nonperforming—about 18% of the total. Compare that with the fact that, at the height of the financial crisis, only 5% of the loans in U.S. banks were categorized as nonperforming. The problems have been made worse by the negative interest rates prevailing across Europe (try making money on zero- or negative-interest loans), and worse still by new European Union provisions that restrict state aid for companies, meaning that the Italian government is prohibited from using tax dollars to recapitalize its banking system. Instead, the banks are required to go into a form of bankruptcy, which would mean losses by ordinary Italian savers who own bank-issued bonds. At last count, the $221 billion worth of citizen-held bonds makes up 5% of their total savings. The European Commission is obviously not anxious to have its rules prevent one of its founding members from restoring financial health so soon after the Brexit vote, and is said to be looking for a solution. One creative way out might be for the government to declare that the bonds were sold fraudulently—and there might be a case, since citizens apparently believed they were buying the bonds was as safe as banking deposits. In that case, the government could set up a restitution fund, and buy the bonds back at a slight discount, recapitalizing its banking system through the back door. One way or another, you will hear about yet another strain on the European economy and another severe test on the loyalties of another important member of it. What will the press call the possibility of an Italian exit from the Eurozone: Ixit? Itexit?